The topic of the interconnectedness of planets in Astrology led me to a memory. I remember reading that energy cannot be created or destroyed so that Shakespeare's atoms have dispersed throughout our planet and we have atoms of Shakespeare in us - all of us. I found this Scientific American article: Is energy always conserved, even in the case of the expanding universe? It turns out to be the case. This metaphor of our connectedness to Shakespeare is charming and real. Here's the article that estimates the number of Shakespeare's atoms in a living human being. "If you live to 75 years, some 500 trillion of his atoms enter you during your life." The interconnectedness also shows up for me when I take photos of urban grunge. These are pictures of decay of various surfaces - e.g. paint on wood or metal, on asphalt, rust patterns. 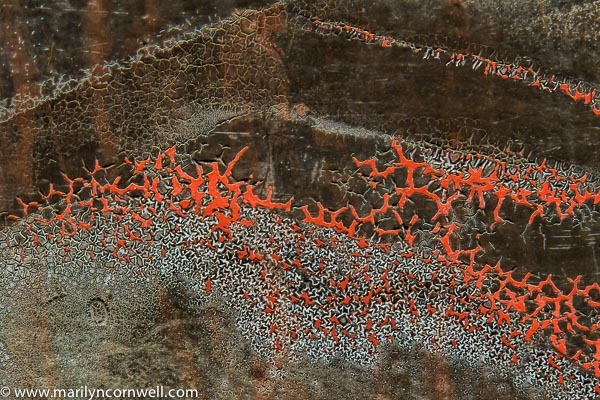 The patterns and shapes of their decay are consistent with the patterns and shapes in organic materials in nature. This is a picture of decaying metal on a rail car at Strasburg last year. Black paint in crackling with red paint underneath. Most viewers see something in the range of a volcano's lava flow. Isn't it remarkable for this quality?